The Wildcats come together following the 3-1 win over Flint Powers Catholic. TRENTON, MI — Alpena improved to 14-4-1 on the season following their 3-1 victory over Flint Powers Catholic. 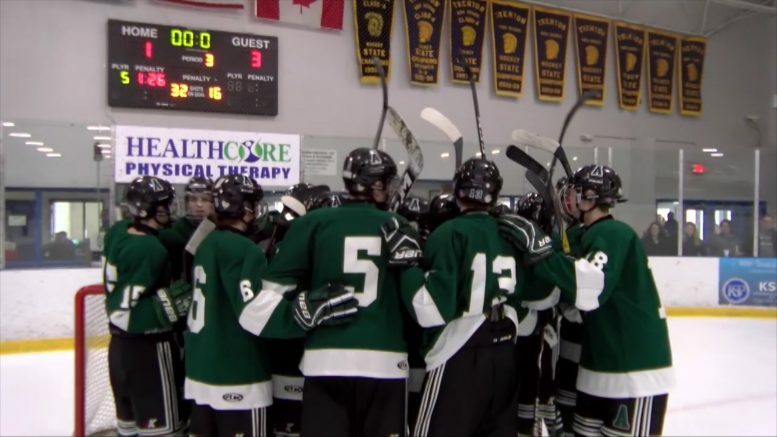 FPC recently overtook Alpena as the 8th ranked team in division 3 hockey, though the scoreboard and result does the talking for the Wildcats. FPC took the lead on a Tyler Lawrence goal in the first period, but Alpena would respond quickly. Colby Plowman set up Kyle VanDusen in front of the net who scored the equalizer for Alpena. VanDusen add two more second period goals, and earning a natural hat trick in the process. A hat trick is considered “natural” when the three goals are scored consecutively without anyone else scoring during the players streak. Alpena has another early game on Saturday at 10:40am against Grand Rapids Christian.